As can be seen from port configuration table, right after reset CRL and CRH both have a value of 0x44444444. This value means floating input mode. IDR registers are responsible for digital inputs while ODR registers are responsible for digital outputs. In both registers the upper 16 bits are always kept 0 because GPIOs are 16 bits wide while their representative registers are 32 bit wide. Thus only the lower 16 nibbles are of concern. The code writing convention will be 0x0000xxxx for IDRs and ODRs. The upper nibbles are reserved and thus set as zeroes. Just like CRL and CRH, IDR and ODR should be accessed as 32 words. 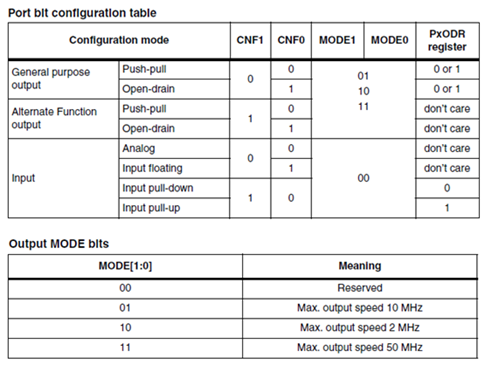 CRL and CRH should be initialized first before using ODR or IDR registers of a GPIO port. Reset values of IDR and ODR are both zero. This ensures initial logic low state for ODR and float state for IDR. After each device reset, all peripheral clocks are disabled (except for the SRAM and FLITF). Before using a peripheral you have to enable its clock in the RCC_AHBENR, RCC_APB1ENR or RCC_APB2ENR register. These registers are important and should always be set before using an internal peripheral. The above registers should be set first before anything else. MikroC for ARM has a built-in library for GPIO. Though such libraries are easy to get started with even without getting an insight of the internal registers, they are both space and execution time consuming things. Thus for simple works best is avoid them unless their use makes a big program easy to understand and deal with. 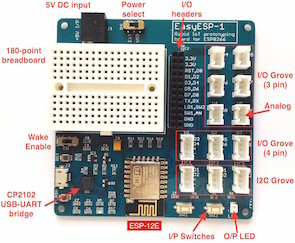 The program will just blink an LED connected to PB15 with an on time and off time of 200ms unless the button connected to PA0 is pressed. When the button is pressed the delay time is altered to 600ms instead of 200ms. 600ms delay is maintain until the button is released. A STM32F108C8 micro embedded in a mini ARM development board from LC Technology was used in this demo.